One look at this turtle and you will never litter again. Turtle researcher Nathan Robinson and his colleague, Chris Figgener, were looking for mating sea turtles off the coast of Costa Rica when they came across an olive ridley sea turtle with something odd up his nose. Robinson, who's currently studying creatures who live on sea turtles, originally thought it was a tubeworm. But when he tried to pull it out, he realized it was something quite different. "When it first came out of the water, you could hear it had labored breathing," he told The Dodo, adding that turtle was also grunting and wheezing. 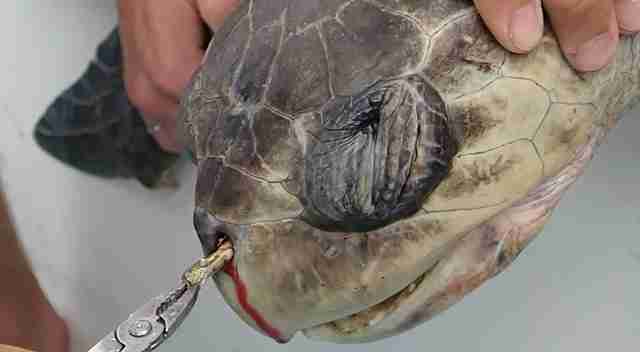 It was a plastic straw, which was fully lodged up the poor turtle's nostril and had likely been there quite a while as it was faded and worn. After the first piece came out, the team realized that they had no choice but to help the turtle by removing the rest. "Once we realized it was plastic there really was no going back anymore," he said. "It was already half removed from the animal ... We decided the most ethical, appropriate thing to do was to remove the straw that was obstructing the airways of this animal." For the next eight minutes the team struggled to coax the straw out of the turtle's sinuses, as gently yet effectively as possible. While the turtle was in obvious pain, the team was miles from any veterinary care, and knew that a "field operation" was the best shot to restore his breathing. But finally, after some very tense efforts, the straw popped out. The team applied iodine to sterilize the area and kept the turtle on board for observation. Fortunately, after just a few minutes, the sea turtle seemed ready to head home. "Within one or two minutes the bleeding out of its nose had stopped and the turtle was still active and very mobile so we released him straight into the ocean," Robinson said. One question Robinson can't answer is how the straw got there in the first place. "I'm just as baffled as everyone else as to how this managed to get so deeply inside a turtle's nose," he said. "Maybe when it was rummaging through the seafloor looking for crabs and mollusks to eat, it could have impaled itself on the straw." Robinson acknowledged the video is unpleasant, but he said he hopes it raises awareness of the effect human garbage has on sea turtles and other wildlife. 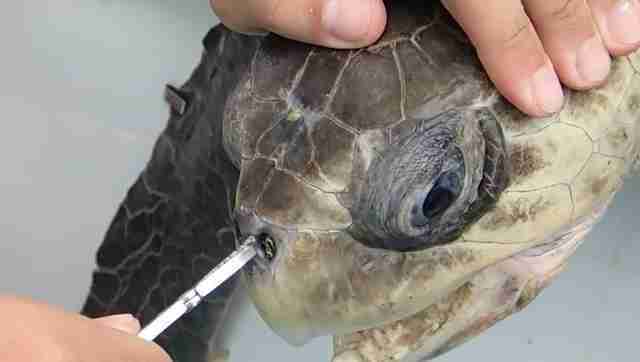 In his years as a turtle researcher he's seen many animals injured by human detritus, especially fishing hooks. 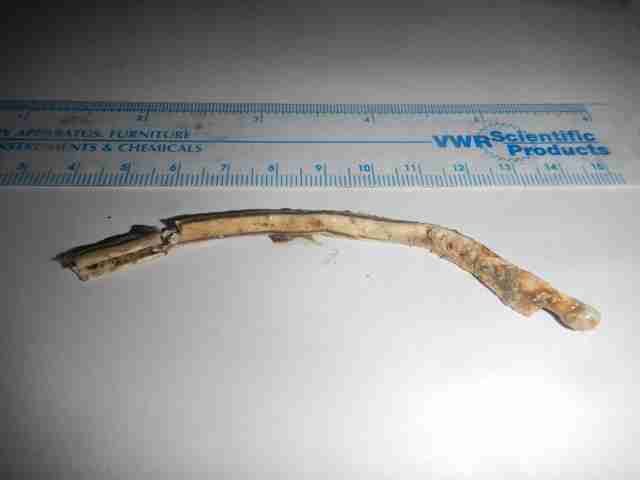 He recently found an animal with fishing line hanging out his back end but the hook still embedded inside; unfortunately the team was unable to help him. But any piece of human garbage can pose dangers, as this recent rescue shows. Robinson said there have even been cases of turtles who've dragged lawn chairs behind them for weeks at a time. And on his Facebook page, Robinson noted that he hopes people will "say no to all single-use plastic." "It's very hard to watch, very visceral," Robinson told The Dodo about the recent video. "It's a shock tactic, I guess. I hope it's a big enough impact to show that this is humans' impact on the world." You can view the videos below, but be warned that, as Robinson noted, they're very hard to watch.